On paper, newer, more complicated, more fearsome weapons comprise Russia’s nuclear arsenal. Russia’s RS-24 Yars Intercontinental ballistic missile (ICBM), introduced in the mid 2000s, can strike anywhere in the US with what some report to be ten independently targetable nuclear warheads. These ten warheads would reenter the earth’s atmosphere at hypersonic speeds, around 5 miles a second. China has developed a similar platform, and the US simply has no way to defend against a salvo of such devastating nukes. In comparison, the US’s Minuteman III ICBM also reenters the atmosphere at hypersonic speeds, but carries just one warhead, and was introduced in the 1970s. But the question of whose are better is more a philosophical one than a straight comparison of capabilities. Lewis says that US Strategic Command leaders, who command the US’s nuclear arsenal, have said for decades that given the choice between the US’s nukes and Russia’s they’d choose our own missiles every time. In an interview with Business Insider, Lewis said that the US’s arsenal, while it lacks the potential to devastate and lay waste to whole continents, much better fits the US’s strategic needs. “Russians made a really different design choice than we did,” when it came to building ICBMs, said Lewis. “Russia built nuclear weapons that are incremental improvements,” or weapons that would need updating every decade or so. The philosophical differences don’t end there. “Russians love to put missiles on trucks,” said Lewis, while the US prefer land-based silos, which present a reliable target and lack mobility. 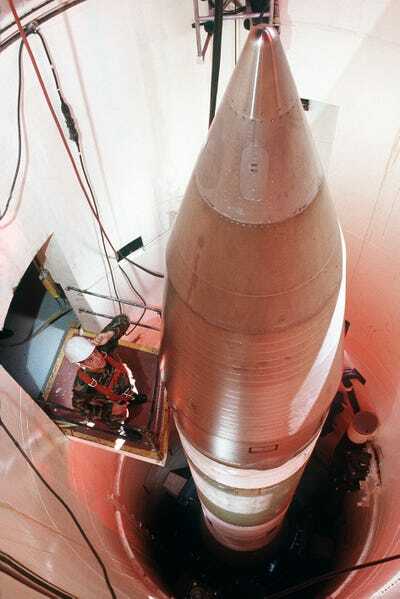 During the height of the Cold War, the US did at one point try a truck-launched ICBM, but US safety and durability requirements far exceeded that of the Russians rendering the platform unreasonable. “If you look at the truck [the US] built for missiles, it’s ten times more expensive. It’s radiation hardened and way less vulnerable,” explained Lewis. “We gold plated the thing,” he joked. Public DomainA Minuteman-III missile in its silo in 1989. The US takes its nuclear arms seriously, and doesn’t sit them on trucks or parade them for show. “[The US] can’t do things the Russians did because we’re not going to put missiles on a crappy truck,” said Lewis. Meanwhile, the Russian philosophy relies on sneakiness and achieving a threat without breaking the bank. “Good luck trying to find it, it doesn’t have to be gold plated,” Lewis said of the Russian’s idea of missile trucks. “[The US] like things that are reliable, things that can be maintained, things that you have to really train people to do,” explained Lewis. This difference stems from the people who comprise the US military, and how they differ from the Russians. It’s that professionalism at the core of the US military that makes America a different kind of world power. We prefer accuracy over destructive capability. “We love accuracy.” Lewis says the US’s ideal nuke is “a tiny little nuclear weapon we’ll fly right through the window and blow up the building.” Meanwhile, the Russians would rather put 10 warheads on the building and level the whole city, civilians and all. “You see it in Syria, that’s how they show it off,” Lewis said of Russia’s air campaign in Syria, where Moscow has been accused of using cluster bombs, incendiary munitions, and indiscriminately bombing hospitals and refugee camps. This careless and brutal attitude is a defining trait of Russia’s military. 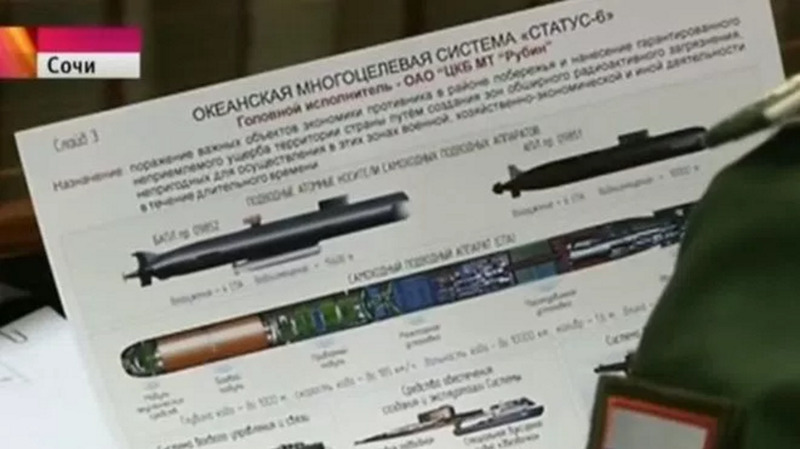 For instance, Russia’s leaked Status 6 nuclear “doomsday” weapon, a “robotic mini-submarine” that can make 100 knots with a range of 6,200 miles is a nuclear-armed dirty bomb. The bomb would not only nuke, but turn the waters around a harbour radioactive for years to come. The US never even considers this kind of devastation, and they don’t want to. BBCA briefing slide of the alleged Status-6 nuclear torpedo captured from Russian television. Russia’s nuclear ambitions, as shown in its nuclear arms, are “deeply deeply deeply immoral,” says Lewis. A Russian nuclear ICBM would blast into orbit, turn around, break into individual reentry vehicles, and drive towards their individual targets at Mach 23. The US simply can’t afford or design a system that would destroy ten nuclear warheads travelling at those mind-bending speed toward the the US. Another possible solution would be to destroy the missiles before they exit the atmosphere, but that means shooting them down over Russia, which presents its own problems. 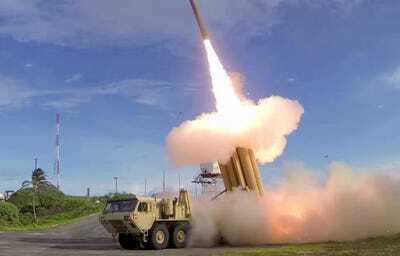 Missile Defence AgencyThe US has the most advanced missile defences in the world. But no missile defence systems can defend a whole continent from 1000s of hypersonic missiles. Another possible solution would be to destroy the missiles from satellites in space, but according to Lewis, the US would have to increase their satellite launches 12 fold before they have enough space assets to protect the US. 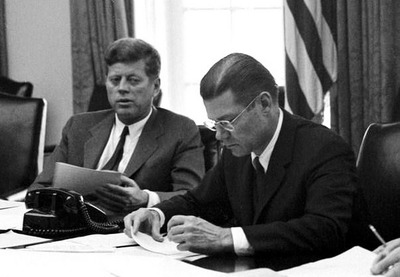 JFK LibraryFormer US President John F. Kennedy during the Cuban missile crisis. Instead of spending years of time, trillions of dollars, and escalating an arms race, the US relies on a doctrine known as mutually assured destruction (MAD). Lewis explained that in the days of John F. Kennedy, the US puzzled over how to size its nuclear arsenal. The Kennedy administration decided to build enough nukes to destroy the Soviet Union if necessary. The administration named the doctrine “assured destruction,” but critics pointed out that nuclear salvos would be travelling both ways, so the more apt name was “mutually assured destruction,” intended as an insult to Kennedy’s policy. “There was no real theory of victory,” said Lewis. As Russian President Vladimir Putin once said, Russia could destroy the US in “half an hour or less,” using its overblown doomsday devices. But the fact is that US Minutemen III rockets that would vaporise the Kremlin just seconds later. Wikimedia CommonsThe US Nuclear triad. The US finds it most stabilizing to have a nuclear triad, or three varieties of nuclear weapons available at any time. 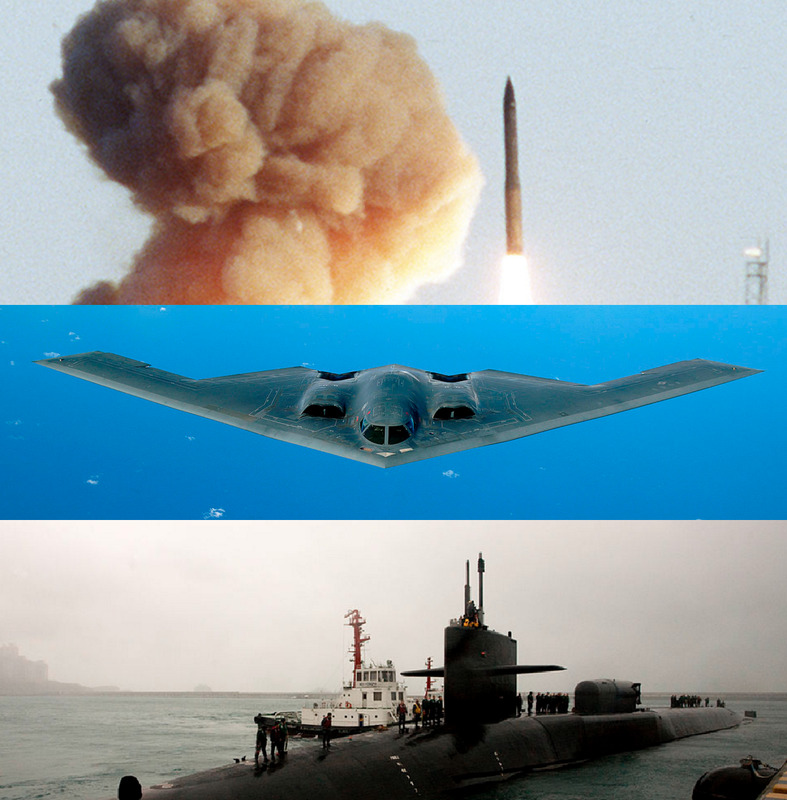 Submarines, land-based silos, and bomber planes all hold nuclear missiles. No attack from Russia could simultaneously neutralise all three. Nothing could stop the US from retaliating, and nothing would. The US’s nuclear weapons are not doomsday devices that will almost certainly initiate the apocalypse. Precise, professionally maintained, responsibly kept nuclear arms provide the US with a credible deterrent without needlessly endangering billions of lives.